Sariputta Nanda Mahamoggallana Mahakassapa Ananda Isidasi Anuruddha Mahakaccana Angulimala Visakha and many more. 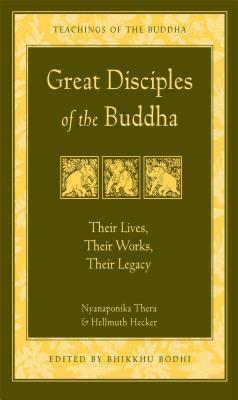 Conveniently annotated with the same system of sutta references used in each of the other series volumes, Great Disciples of the Buddha allows the reader to easily place each student in the larger picture of Buddha's life. It is a volume that no serious student of Buddhism should miss. Nyanaponika Thera, a German-born Buddhist monk, was a scholar, translator, and founder of The Buddhist Publication Society in Sri Lanka. Thera died in 1994 at the age of 93. Hellmuth Hecker is a leading German writer on Buddhism and a translator from the Pali Canon. His books include a german translation of the Samyutta Nikaya (parts 4 and 5) a two-volume chronicle on Buddhism in Germany, and a biography of Ven. Nyanatiloka Mahathera, the first German Buddhist monk. Ven. Bhikkhu Bodhi is an American Buddhist monk from New York City, born in 1944. He obtained a BA in philosophy from Brooklyn College and a PhD in philosophy from Claremont Graduate School. After completing his university studies he traveled to Sri Lanka, where he received novice ordination in 1972 and full ordination in 1973, both under the leading Sri Lankan scholar-monk, Ven. Balangoda Ananda Maitreya (1896-1998). From 1984 to 2002 he was the editor for the Buddhist Publication Society in Kandy, where he lived for ten years with the senior German monk, Ven. Nyanaponika Thera (1901-1994), at the Forest Hermitage. He returned to the U.S. in 2002. He currently lives and teaches at Chuang Yen Monastery in Carmel, New York. Ven. Bodhi has many important publications to his credit, either as author, translator, or editor. These include The Middle Length Discourses of the Buddha (Majjhima Nikaya, 1995), The Connected Discourses of the Buddha (Samyutta Nikaya, 2000), and The Numerical Discourses of the Buddha (Anguttara Nikaya, 2012). In 2008, together with several of his students, Ven. Bodhi founded Buddhist Global Relief, a nonprofit supporting hunger relief, sustainable agriculture, and education in countries suffering from chronic poverty and malnutrition.